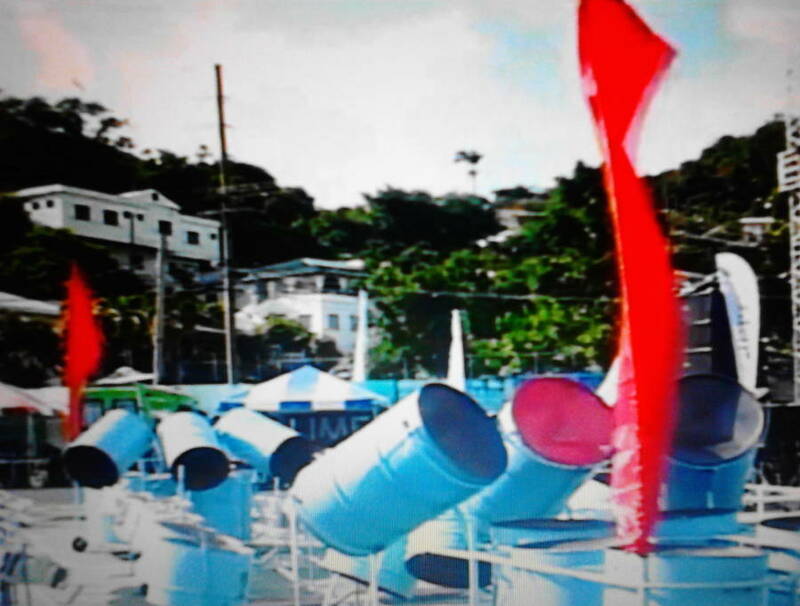 Carnival stakeholders have openly expressed their disappointment with the arrangement for major events of Grenada’s 2014 Carnival, which officially began on Saturday with the Children’s Carnival Frolic taking place at the Tanteen Netball Court. Just before the start of the Junior Steelband Competition, David “Peck” Edwards, who is an executive member of the Grenada Steelband Association, informed those attending the event that the red flags which are flown close to the stage area are a sign of protest from the stakeholders with regard to the venue for the major events. “Spicemas deserves better, you as patrons deserves better, we as stakeholders deserve better. We are not satisfied with the venue, so we are making this small protest to express our non-satisfaction,” he said to the hundreds who were in attendance. Spicemas Corporation which is the legally appointment statutory body responsible for the marketing and administration of carnival activities is having a challenging time this year in not having a home for Carnival 2014. The National Cricket Stadium which has been the main venue for the past years, is partially unavailable because of two upcoming One Day International Cricket games between Bangladesh and the West Indies. The games are scheduled to take place days after Carnival, and if the field is used as normal for Carnival, it will not be able to be ready for games. In May, Alistair Bain, the Chairman of the Corporation, announced that the Roy St John Playing Field at Tanteen will host all the major venue for Carnival 2014, but following an assessment of the grounds it was calculated that it would cost almost EC$500,000 to make it Carnival-ready. Due to a lack of funding, the Corporation held discussions with the National Stadium Authority and the relevant cricket personnel, who agreed that limited use of the cricket stadium would be allowed. As a result, Spicemas Corporation announced that Children’s Carnival Frolic and the Panorama competition would be held at the Tanteen Netball Court, while the Carnival Queen Show, Soca Monarch and the Dimanche Gras shows would be at the National Cricket Stadium.